I was getting ready to do my monthly favorites for January and realized I had more movie favorites than actual favorites.... #movieaddict So instead of having a ginormous favorites post I decided to split it up into two posts, one all about the movies I've been loving for the month and then the other my random favorites! I don't know why I watched more movies this month than others but it happened. I don't hate that it did. Four of the movies I've seen this month are up for the Oscar for Best Picture, Actor, Actress and a variety of other noms and one is up for various other Oscars. This month was veeery film heavy. 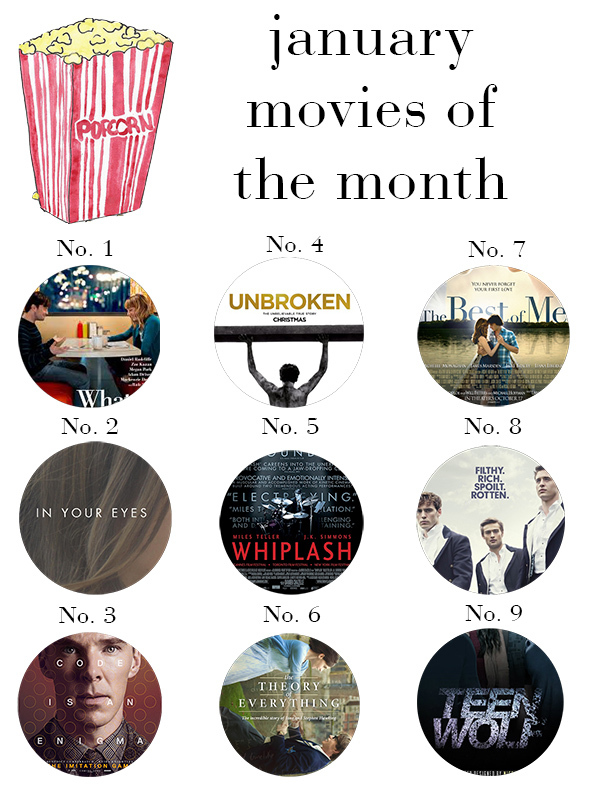 Enough of me chitchatting and onto the movies I've loved for the month of January! No. 1: What If// -Who's in it: Daniel Radcliffe and Zoe Kazan -Genre: Romantic Comedy -Where to watch? : Redbox -What's it about? : Wallace, who is burned out from a string of failed relationships, forms an instant bond with Chantry, who lives with her longtime boyfriend. Together, they puzzle out what it means if your best friend is also the love of your life. -Why should I watch? : It's a cute and quirky movie that's fun and lighthearted with a touch of romance and drama. If you're looking for a movie to watch with your girls or best friend, this is it. No. 2: In Your Eyes// -Who's in it? : Zoe Kazan, Michael Stahl-David, Nikki Reed, Mark Feuerstein -Genre: Romantic drama with a touch of comedy -Where to watch: Netflix -What's it about? : Two seemingly unconnected souls from different corners of the United States make a telepathic bond that allows them to see, hear and feel the others experiences, creating a bond that apparently can't be broken. -Why should I watch? : This is one of my favorite romantic movies. It's such a different story line of finding your soul mate and when they'll come into your life. It's amazing and I HIGHLY recommend watching it! No. 3: The Imitation Game// Oscar nominated for Best Picture -Who's in it? : Benedict Cumberbatch, Kiera Knightley, Matthew Goode, -Genre: Biography and Drama -Where to watch: Theaters -What's it about? : Based on the real life story of genius mathematician Alan Turing and his brilliant team of code-breakers who crack the uncrackable enigma machine during the darkest days of World War II. -Why should I watch? : Alan Turing is the unsung hero of World War II. He did the impossible and unthinkable. He should be written in every history book. He is a hero in all the aspects of the word. It's a must watch. No. 4: Unbroken// Oscar nominated -Who's in it? : Jack O'Connell, Domhnall Gleeson, Finn Wittock, Garrett Hedlund -Genre: Biography, Drama, Sport, War -Where to watch: Theaters -What's it about? : Louis Zamperini is an Olympic track athlete who's now a soldier of World War II. He survives a plane crash in the Pacific only to be captured by the Japanese and made a POW. Louis's determination and fighting spirit keep him alive and help him survive. -Why should I watch? : Everything about this movie is amazing, from the cinematography, story, directing, music, acting, everything. It's inspiring and emotional, powerful and poignant. It's a must see. No. 5: Whiplash// Oscar nominated for Best Picture -Who's in it? : Miles Teller, JK Simmons -Genre: Drama and Music -Where to watch? : Theaters -What's it about? : Andrew is a young and talented drummer attending a prestigious music academy where he dreams of becoming a renowned musician. He is taken under the wing of the most respected professor at the school who doesn't hold back abuse to him and pushes him beyond what he knew he was capable of. -Why should I watch? : Miles Teller and JK Simmons give emotional and thrilling performances. It shows what a musician is willing to endure to become one of the greats and how far teachers push them. It's pretty intense but makes it worth while. No. 6: The Theory of Everything// Oscar nominated for Best Picture -Who's in it? : Eddie Redmayne, Felicity Jones -Genre: Biography, Drama and Romance -Where to watch? : Theaters -What's it about? : The Theory of Everything tells the emotional story of brilliant and celebrated physicist Stephen Hawking, his journey with ALS and his relationship with his wife Jane. -Why should I watch? : Eddie Redmayne did a brilliantly phenomenal job of playing Stephen Hawking and deserves the Oscar for Best Actor. It was such a physically demanding role and he nailed it on the head. The story of Stephen is poignant and inspiring and shows the power of hope, love and perseverance. No. 7: Best of Me// -Who's in it? : Michelle, Mongahan, James Marsden, Luke Bracey, Liana Liberato, Gerald McRaney -Genre: Romantic drama -Where to watch? : Redbox -What's it about? : Amanda and Dawson are soulmates who met as teens but were from very different backgrounds. Life's circumstances forced them to part and 20 years later brought them back together after the death of a close friend. They go back to fulfill his final wishes and in doing so reconnect and find that it's hard to forget your first love. -Why should I watch? : Other than the fact that it's a Nicholas Sparks movie? It's the second NS movie that's made me bawl like a baby. The story is very Romeo Juliet and portrayed in a beautifully emotional way. It's now my favorite NS movie. No. 8: The Riot Club// -Who's in it? : Sam Clafin, Douglas Booth, Max Irons, Holliday Grainger, Matthew Beard, Ben Schnetzer, Sam Reid -Genre: Drama and Thriller -What's it about? : Two first-year students at Oxford University join the infamous Riot Club, where reputations can be made or destroyed over the course of a single evening. -Why should I watch? : I'll be honest I was drawn to it because of the eye candy cast and British accents. The movie is alright nothing special but a good watch if you're looking for something. If all else fails watch it for the gorgeous boys and swoonworthy accents. No. 9: Teen Wolf// (Okay it's not a 'movie' but it's still film) -Who's in it? : Tyler Posey, Dylan O'Brien, Tyler Hoechlin, Holland Roden, Crystal Reed, Genre: Comedy, Drama, Teen -Where to watch: MTV -What's it about? : Scott is an awkward teenager in high school until one night when he's bitten by a werewolf. The show follows Scott as he's a regular guy by day and a werewolf by night. With help from his best friend Stiles, his mentor Derek and his girlfriend Allison he embarks in the journey of being a werewolf. -Why you should watch? : I remember seeing tons of love for it on Twitter but never really checked it out. Finally I decided and bit the bullet (no pun intended) and holy I love this show. From the comedy of Stiles to the smoking hot cast, it's an easy watch that will have you in fits of laughter or hot flash from the man candy on screen. I'm thinking of maybe making this a regular post, where I share my favorite movies of the month? Thoughts? "to make a great film you need three things; the script, the script, the script"